VouchedATL [& friends] at the Decatur Book Festival! 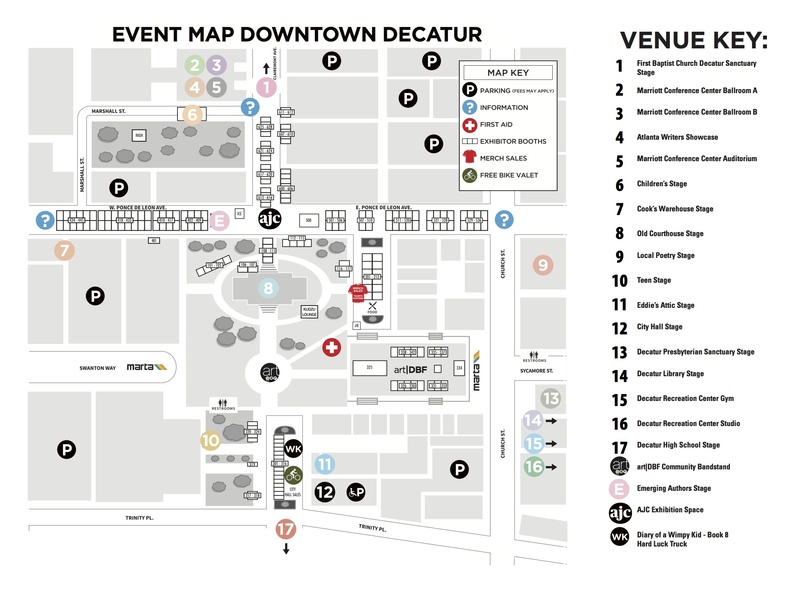 It’s Labor Day weekend which in Atlanta means the Decatur Book Festival is taking the city by storm! Once again, the Vouched table will be set up at the festival all weekend. This year we’ll be in the first-ever ART | DBF pavilion, and in really good company there, neighbored by arts organizations such as our pals at BURNAWAY, Wonderroot, gloATL, Indie Craft Experience, MOCA GA, the High Museum, and more! You’ll find us in booth 342 with some of the crew from Loose Change Magazine. 11a-12p: The Wren’s Nest Publishing Company will be releasing the work of the Wren’s Nest Kipp Scribes at Core Studios (139 Sycamore Street) If you attended this year’s Vouched Birthday Party and enjoyed what you heard, this is your best opportunity to meet the young authors who penned the stories and some of the great people behind the Wren’s Nest’s Educational Programs! R.S.V.P here! 4:15p-5p; Digging and Delving: Resurrecting the Southern Past in Fiction featuring Charles McNair and Matthew Guinn at the Decatur Library Stage. 12p-12:45p: Clayton State University hosts readings from Brigitte Byrd, Roberto Gibraltarik and Robert Pfeiffer at the Local Poetry Stage. 1:30p – 2:30 p: The Wren’s Nest will host its second book release of the weekend! This time the book is Smoke Signals – the seventh annual literary journal produced entirely by Atlanta-area high school students participating in the Wren’s Nest summer publishing program. The release will take place at Core Studios (139 Sycamore street), R.S.V.P. here! 2:00p-2:45p: Caprice Crane, Sara Shephard, and Terra Elan McVoy discuss their work in the panel When Good Girls Go Bad at the Teen Stage. 4p- 5p: The Emory Poetry Council will be hosting Malachi Black, Jericho Brown, Dana Sokolowski, Gina Myers, and Bruce Covey! Java Monkey (425 Church St.) R.S.V.P. here! 4:15p-5p: The Best American Poetry 2013 Book Launch at the First Baptist Decatur Sanctuary Stage featuring readings from Thomas Lux, David Kirby, Jericho Brown, Denise Duhamel, Kevin Young, and David Lehman. 5p – 6p: Write Club Atlanta is taking its bouts to the streets! Watch Bobbin Wages go head-to-head with Mike Molina on Peace vs. War! Josh Green takes on Jessica Handler with crime vs. punishment! The battle will take place at the Decatur Rec Center. R.S.V.P. here!